Top: (from left) Andrew Heiberger, Honoree; Ofer Yardeni, Chairman of the FIDF Real Estate Division. Center: Soldiers of the IDF. Bottom: (from left) Danny Hakimian; FIDF National Director, Maj.Gen.(Res. ), Yitzhak (Jerry) Gershon; Michael Livian. The Real Estate Division of the Friends of the Israel Defense Forces (FIDF) held its annual Real Estate Division Reception on Monday, December 12, 2011 at The New York Public Library. The honoree was Andrew Heiberger, Founder, Chairman and CEO of Town Residential LLC. Event chairs were Ofer Yardeni, Stonehenge Partners, Inc., and Chairman of the FIDF Real Estate Division; Chairmen Emeritus Moshe Azogui, MDA Holdings; Chairmen Emeritus Richard Born, BD Equities; and Chairman of Young Professionals Lenny Sporn, The Tavivian Sporn Group/Co Founder, Prudential Douglas Eliman. Close to 450 people attended the Reception in support of the soldiers of Israel. Guests enjoyed cocktails, hors d'oeuvres, a buffet dinner, the opportunity to talk with soldiers of the IDF and bid on auction items such as a VIP tour of Yankee stadium, wine country vacation package, and attend Mercedes-Benz Fashion Week and the Grammy's. Honoree Andrew Heiberger spoke about the importance of giving back and looking after the soldiers. Heiberger got involved with the FIDF over three years ago and recently went to Israel with his wife, two children, two grandmothers and uncle. He noted his trip to Israel was so much more fulfilling having a generational presence and visited army bases and observed a sense of pride, unity, and comradery among the soldiers. Heiberger launched the residential brokerage Town a year ago and now has five offices and some 265 agents and staff and is now the fastest-growing brokerage in Manhattan. Town has 152 exclusive listings worth approximately $405 million, with an average asking price of $2.67 million for sales and $7,500 per month for rentals. 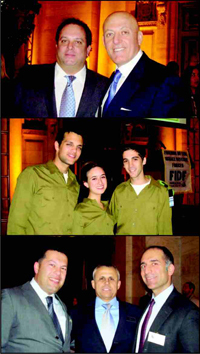 About The 2011-2012 Real Estate Division Campaign: In 2011, upon the successful completion of its fundraising goals for the 2009-2010 campaign, the NY Real Estate Division of FIDF began a new fundraising campaign to raise $750,000 to benefit the soldiers of the IDF. The allocation for the 2011-2012 campaign funds is as follows: $750,000 will be used to build an Expanded Wellbeing Center at Base Revaya A for the soldiers of Battalion 71 of the 188th Brigade. This brand new facility, measuring around 2045 square feet, includes a club, media room/library, canteen and gym, and will serve up to 140 soldiers at a time. The club and canteen give soldiers a place to get a snack, relax, enjoy music or TV. It allows them to enjoy each other's company, or just unwind. The media room/library provides a quiet place to read or research, and the gym gives them a place to release tension and maintain physical fitness. All of these facilities give the soldiers a chance to enjoy a feeling of comfort and a bit of �home� as they take a break from their daily IDF routine. About FIDF: Their job is to look after Israel. Ours is to look after them. The FIDF initiates and helps support social, educational, cultural and recreational programs and facilities for the young men and women soldiers of Israel who defend the Jewish homeland. FIDF also provides support to families of fallen soldiers. Friends of the Israel Defense Forces is a 501(c)(3) not for profit organization.